PAMs are defined as interventions that are systematically applied to modify specific client factors when neurological, musculoskeletal, or skin conditions are present that may be limiting occupational performance (Bracciano, 2008, p. 2). One of the most common agents used by therapists is heat modalities. Heat modalities are used in a multitude of settings including: outpatient clinics, inpatient rehab, home health. A primary reason for using heat as a preparatory activity is to increase the temperature of soft tissue to a therapeutic range (ideally 104 to 113 degrees Fahrenheit). Applying heat to an area of the body causes a biophysiological response including: increased blood flow, rate of cell metabolism, oxygen consumption, inflammation, decreased fluid viscosity, and a decrease in pain (Bracciano, 2008, p. 104). This article provides the basics for heat modalities, there is much more to learn on heat agents and modalities in general. Depending on what state you practice in, you may be obligated to obtain additional certification in PAMs before administering in practice. Be sure to check with your state licensing board for further requirements. There are two different types of heat application, or thermotherapy, that therapists use: superficial and deep. Whether a modality is classified as superficial or deep depends on the depth of penetration into the underlying tissue. Superficial modalities tend to penetrate the tissues with a depth of equal to or less than 1cm where deep agents can penetrate the tissues at a depth of 3-4cm. Specific types of superficial and deep modalities are listed below. When selecting which type of heat modality, or any modality, to use, it is crucial to understand where the patient is in their recovery. Have they been dealing with carpal tunnel for a few months and want to treat it conservatively or did they just have surgery last week? The information you acquire will determine which modality you select or if you even use modalities at all. Additionally, it is extremely important to assess the patient’s response to treatment. Evaluate pain before and after treatment, skin color and temperature, edema, range of motion, etc. and adjust treatment accordingly. 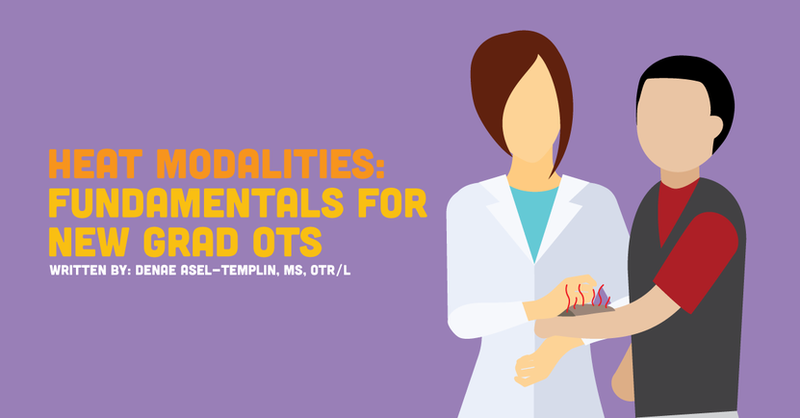 Many conditions seen by OTs would benefit from heat modalities. Common diagnoses that benefit from heat application include: lateral epicondylitis, distal radius fractures, CMC arthritis, and carpal tunnel. Heat can decrease pain and stiffness, improve range of motion, promote healing, and provide relief to your patient. Despite the many benefits that heat application provides, heat modalities are not appropriate for everyone. Some examples of conditions where heat is contraindicated include, but are not limited to: impaired sensation, poor thermal regulation, tumors/cancer, acute inflammation, deep vein thrombosis, infection, open wounds, and rheumatoid arthritis. In some cases, a modality may be indicated and contraindicated for the same condition. For example, heat agents may be contraindicated for a CMC arthroplasty during the initial weeks post-surgery. However, once acute inflammation is controlled and the incision is healed heat may be indicated. It is important to get a full health history and understand indications and contraindications for each modality before administering anything. For all of you visual learners out there, provided below are a few video tutorials of some of the most common heat modalities utilized in practice. Modality application books, Physical Agent Modalities: Theory and Application for the Occupational Therapist is one of my favorites!